Red-tailed hawks eat squirrels but red-shouldered hawks, like this one, are a little too small to make squirrels a normal part of their diet. Perhaps this squirrel knew that. 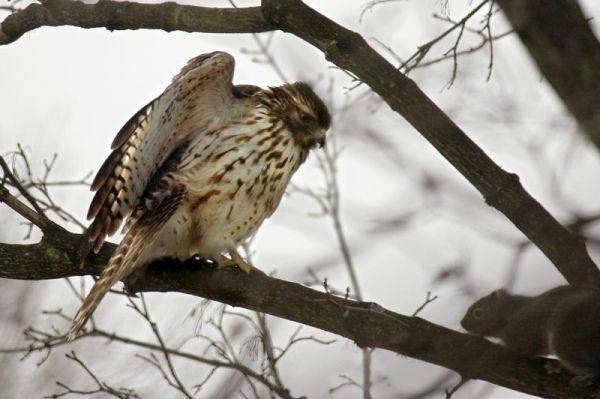 A few years ago Steve Gosser saw an immature red-shouldered hawk perched quietly in his parents backyard. While he watched, a gray squirrel climbed the tree and made a beeline for the hawk. Did the squirrel want to challenge the hawk? Who would win? When the squirrel got too close, the hawk puffed open his wings. The squirrel got the message and left the tree. You know these animals! But my money is on the hawk. That’s amazing. Do squirrels really know the difference between Red-shouldered and Red-tailed hawks, then? Who is safe to challenge, and who is not? What a strange thing to happen. While I was living in Arizona, I watched a young quail hold off a Great Horned Owl for a while, on my front porch one night, seeming to scare the owl each time he got close. Finally the owl just swooped in and grabbed the quail like it was nothing, and plucked and ate him on the railing. My cat quite enjoyed the whole show. Lesson for the squirrel: don’t push your luck, buddy!